A macro lens helps to open up a whole new tiny world that is often beautiful and occasionally a little scary. 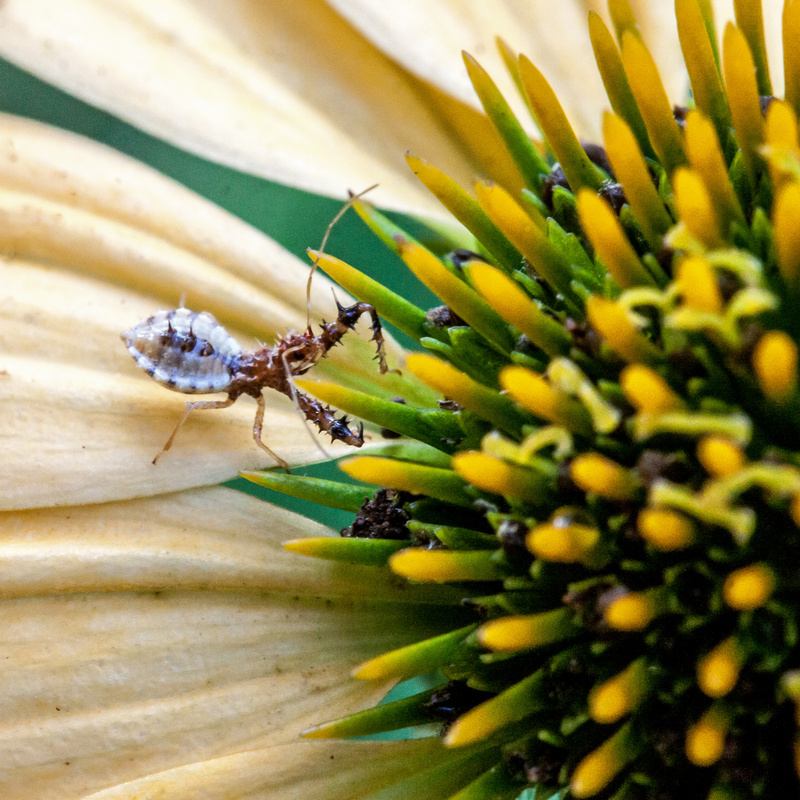 I think that a tiny insect that fellow photographer Cindy Dyer pointed out to me in her garden yesterday fits into the latter category. The insect in question was moving about on an orange cone flower and at first we thought it might be a spider. When we counted the legs and looked a little closer, we realized it was probably a bug, a bug with massive spiked front legs and additional spikes on its body. It was a bit chilling to learn that this was the nymph of an assassin bug, a Spiny Assassin bug in the genus Sinea. As I was taking this photo, I was reminded once again now much I enjoy macro photography. It has its own set of challenges, but it is rewarding to be able to get shots like this. In this image I particularly like the way that the spikes in the center of the cone flower mirror those of the fearsome little insect, which would be a real monster if it were larger. That is one dangerous looking little bug! Great photo! Nor would I (and I love the emoji that you used).